Quickly check for injuries to assess needed attention. Do not move the seriously injured unless they’re at risk of immediate danger. Call for help. Refer to local news or your weather radio for updated information and instructions, such as shelter, clothing, food and water from FEMA, Red Cross and other volunteer agencies. Only return when authorities tell you it’s safe. Ensure drinking water is safe. Do not drink, brush teeth, or wash hands or dishes with water until it has been declared safe. BOIL: Boil for one minute, then cool, storing in clean, covered containers. BLEACH: 1/8 teaspoon or 8 drops of regular, unscented, liquid household bleach per gallon should be used. Let water stand 30 minutes before using. Manage food supplies. Throw out any foods that have come in contact with floodwater, including cans and water bottles that appear sealed. Do not flush toilets until you know sewer lines are intact and properly functioning. Opt for battery powered lighting over candles. Keep a battery-powered radio on hand at all times. Only travel when roads have been cleared safe by authorities, or when absolutely necessary. Beware of washed out roads, unsafe structures (building, bridges, etc. ), downed power lines, chemicals spills, animals, and other health and safety risks. Never enter a damaged building. When in doubt, consult a qualified building inspector prior to entrance. Don’t return to a flood damaged area until it has been cleared as safe by authorities. Wear long pants, a long sleeve shirt, and sturdy shoes when surveying for damage. If it is safe, turn off all utilities at the source (water, gas, electricity). Unplug appliances and let them dry out. Watch for damaged power and gas lines – report them to the utility company immediately. If you smell gas, immediately vacate the premises and notify the fire department and gas company. Quickly address spilled medications, chemicals, and flammable liquids that could pose fire and safety hazards. Take photos of damaged structures and contents for insurance claims. Set priorities, and do not exhaust yourself. When clearing a flooded basement, do so slowly, draining about 1/3 per day, to prevent building collapse. When rebuilding, consider adding a tornado safe room. Funding grants may available in your area. Keep a good record of cleaning and repair costs for insurance reimbursement. Use only reputable, professional disaster recovery services, avoiding drive-by, or transient help. Strengthen your home’s structure when rebuilding with the appropriate reinforcements such as anchors, clips, straps. Use sturdy building materials and the proper structural supports for masonry walls and chimneys. Permanently attach your manufactured home to its foundation. Have all utilities – electrical, gas, and water – tested for safety before restoring operation. Pump out wells and have well water tested for contaminants before drinking. The emotional toll a disaster takes can be more devastating than physical damage and financial difficulties combined. Children and older adults are particularly at risk. Don’t neglect emotional needs. Get help. Contact FEMA, the Red Cross, other volunteer agencies, local churches, or your health insurance company for professional counseling assistance. Letting everyone know you’re safe. 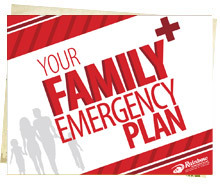 Register for the American Red Cross Safe and Well program by web site or phone (1-866-GET-INFO) to let family and friends know you're safe. Familiarize yourself with the American Red Cross Tornado Safety Checklist. Have a tornado disaster plan in place for before, during, and after a tornado. Luck favors the prepared! 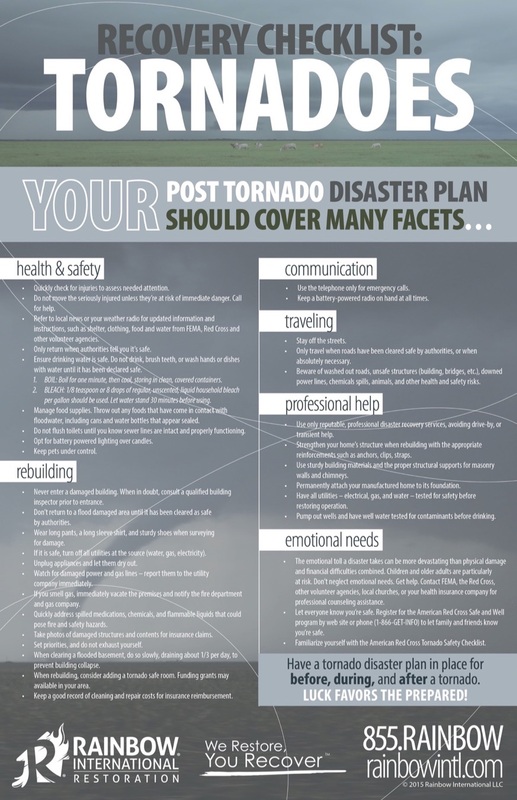 Do you have your tornado disaster plan in place? Rainbow International® can help with reconstruction and recovery. Contact us today to learn more about disaster services available in your area.